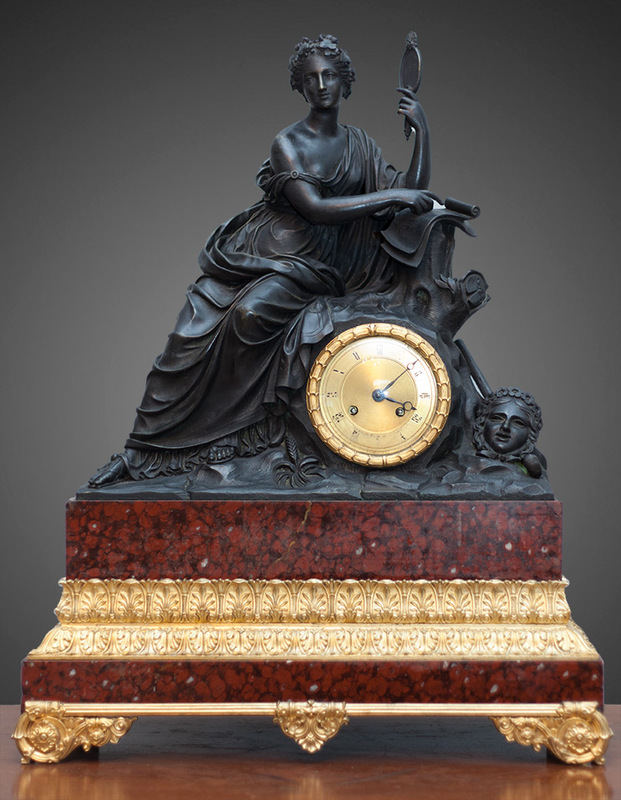 A fine quality Louis-Philippe clock with matching candelabra, by renowned French maker Deniere. 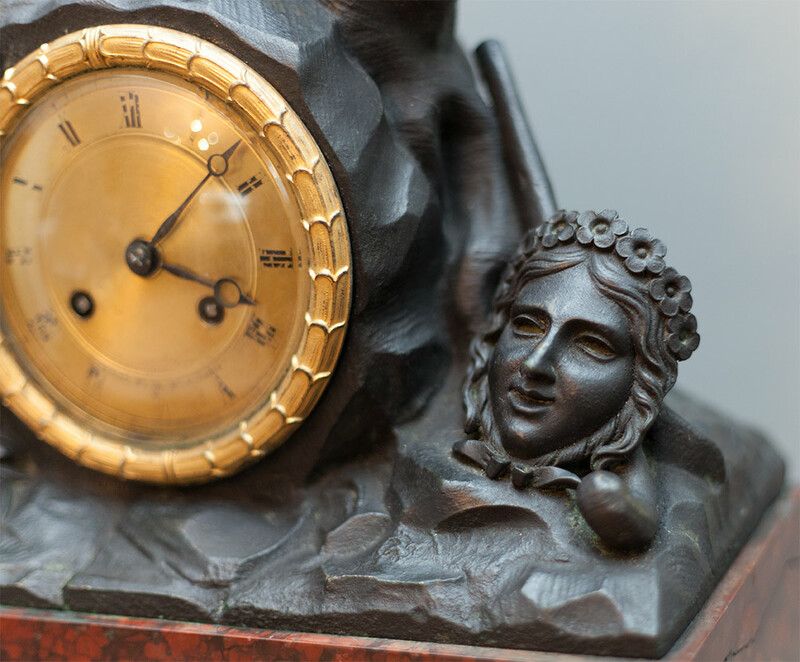 The brass clock dial is set into an exquisitely cast bronze sculpture of Veritas, “Goddess of Truth”. She is in a reclining position and holds a small mirror in her left hand. 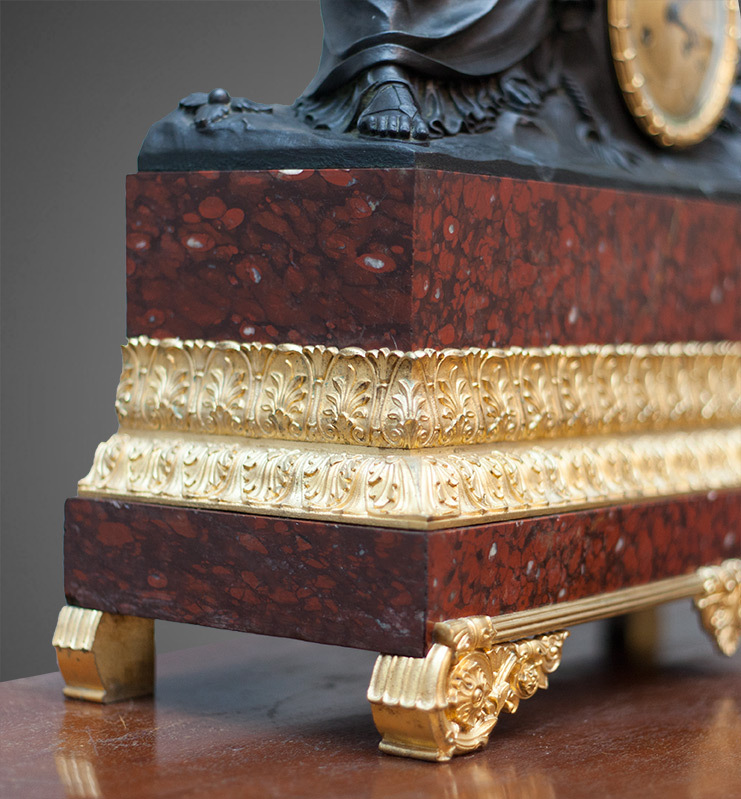 Rouge griotte marble panels create a wonderful contrast between the gilt ormolu and dark patinated bronze. 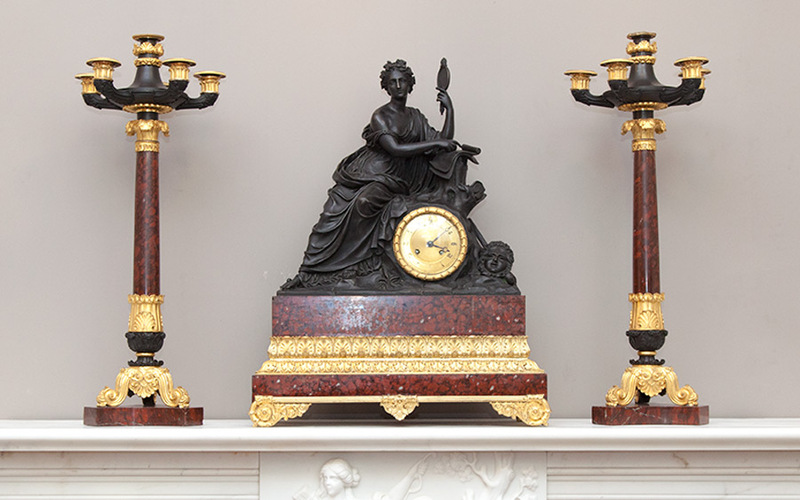 The decorative ormolu mounts are of high quality and are in fine condition on both the clock and candelabra. Movement: A twin train month going movement, with silk suspension by Pons, with seal struck to back, Medaille Dagent 1823, the outside count wheel striking the hours and half hours on a bell. Both mainsprings are signed and dated Maupin et Cie, 1833. 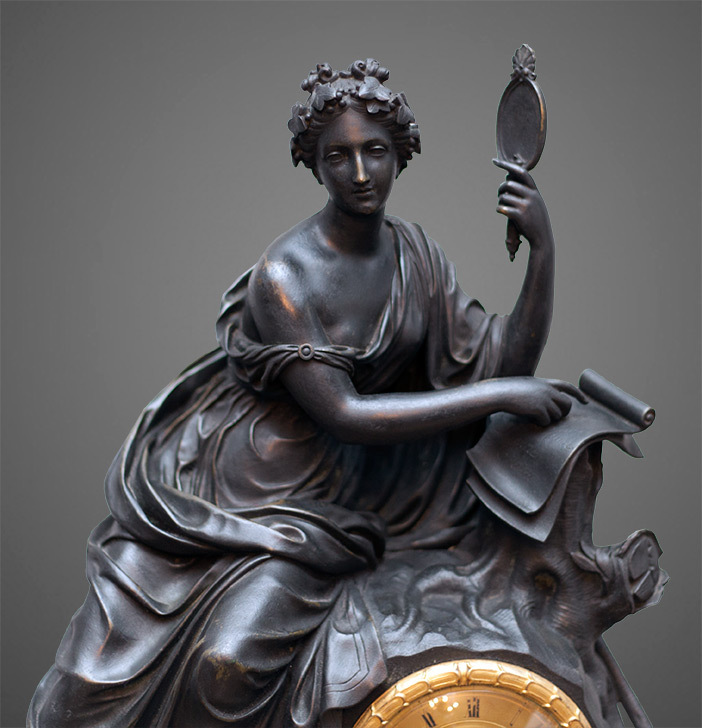 Deniere et Matelin were prominent French bronzers, producers of ornamental patinated and gilt-bronze objects and clocks during the First French Empire periods. 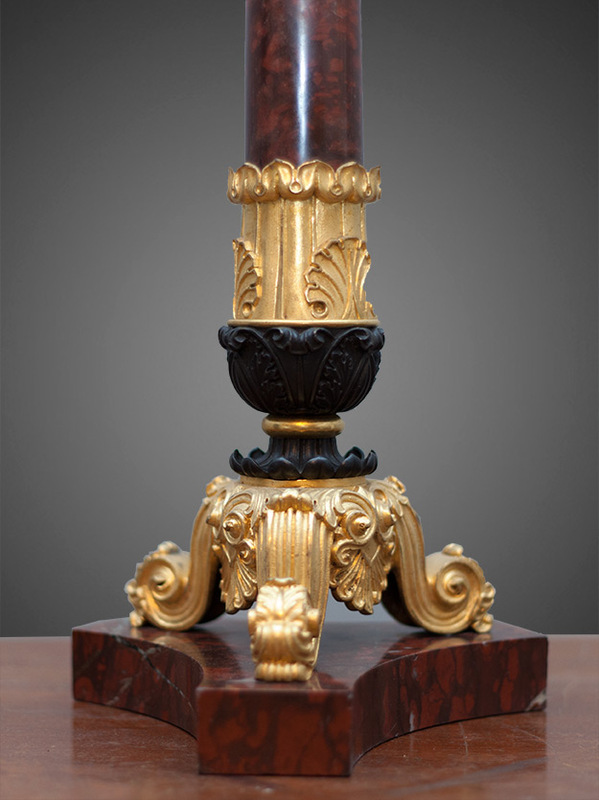 Named for Jean-François Denière (1774–1866)) and François Thomas Matelin (1759–1815), the firm is best known for the production of ormolu furniture mounts, candelabra, torchères, and ornamental mantel clocks. Suppliers to the French court before the revolution, after the revolution and before the establishment of the First Empire under First-Consul, Napoleon Bonaparte. They primarily exported to European courts and nobility and the emerging United States. Under the Empire government the firm regained favour in France, producing furniture mounts, candelabra and clock cases for the homes of the regime.